Varkala beach is a beautiful picturesque beach in south Kerala and is a more peaceful alternative to the busy Kovalam beach. The location of this beach will do nothing more than take your breath away! 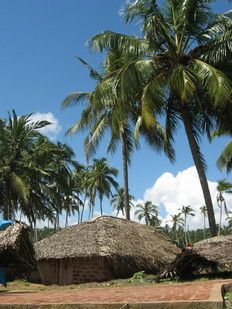 A path runs along the top of the cliff and is bordered by coconut palms, wooden shacks and small bars and cafes. From high up on the cliff you can take in a beautiful sunset while waves smash on the beach below you and the cool sea air ruffles your hair. The location of this spectacular place is enough of a reason to stay for a couple of weeks but it's not the only reason people visit Varkala. The laid back atmosphere of the little community that has settled here provides an excellent base for meditation and reflection while offering great opportunities to meet new people and make friends. 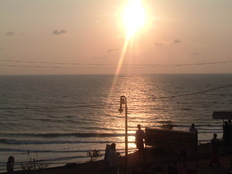 Varkala is probably one of the best places in India to watch a good sunset. Sitting in one of the bars on top of the cliff and watching the golden sun melting into the sea can be a really humbling experience and is enough to send shivers down your spine. The spirituality of this place is made obvious by the various Meditation, Yoga and Ayuverdic centres that are dotted around the area. The more time you spend here the more you realise what a special place it is. Even a few days in this magical place is enough for complete relaxation and leaves you in good stead to continue your journey. Varkala is still a small holy town so it's advised that you dress modestly, especially women. In parts of the beach swimming can be a pretty dangerous activity because of the strong currents, it's still possible but just be careful. 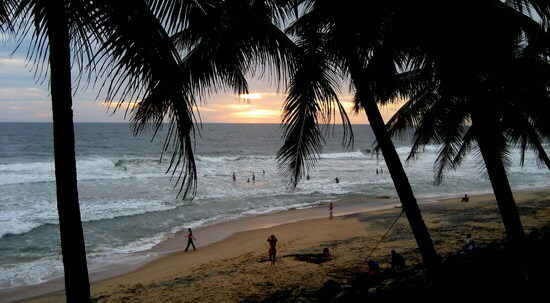 Here's a short list of other things to do in and around Varkala. 1. Watch a sunset Get comfortable and relax as you witness a truly mesmerizing sunset. 2. Visit Janardhanaswamy Temple The 2000 year old temple sits next to the beach and is a popular pilgrim destination. Well worth a visit. 4. Go surfing, windsurfing, parasailing and scuba diving. Varkala has a great selection of watersports so if you're feeling brave try a bit of scuba diving or parasailing. 5. Go for a spa. 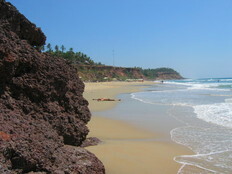 Varkala is famous for its spas and the hot springs are well known for their medicinal properties. 7. Take a day trip to Trivandrum. An excursion to this great place will guarantee a new adventure around every corner. Some activites include feeding and bathing elephants or taking a cruise around the coast on a yacht. 8. Restaurants. There is a great selection of restaurants here all serving up tasty cuisine for a great price. Relax! Relaxation is central to a visit to this great place and it's one thing that's incredibly easy to do. Take time out from visiting temples and taking photos and have a beer, make some friends and get yourself rejuvenated. Bio Veda Hill Resorts has 7 eco friendly independent cottages and a Multi cuisine Restaurant, You can see Neyyar dam and rest of the Neyyar Wild life Sanctuary from this Resort. Deshadan offers the best of everything. Be it the cuisine, the facilities or the comforts. At Deshadan you can explore a wide variety of holiday pleasures. Discover the exotic pleasures of the Beach which lies very close to the resort. Established in the year 2000, Palm Ayurvedic Beach Resort is located few meters away from the exotic varkala beach. The property offers the best view of the magnificent local cliffs and beautiful white sandy beach. There are loads of little shops in and around the small town and they offer a great place to pick up some real Indian handicrafts to take home. Avoid the crap and dig a little deeper and there are some real bargains to be had. The beach is only 46 kilometres from the capital city Trivandrum which has a small international airport which has daily flights from all the big cities in India including Delhi, Cochin, Bangalore, Kolkata and Mumbai. A taxi from here to the beach should cost about 1,400 Rupees or there are various buses and trains. 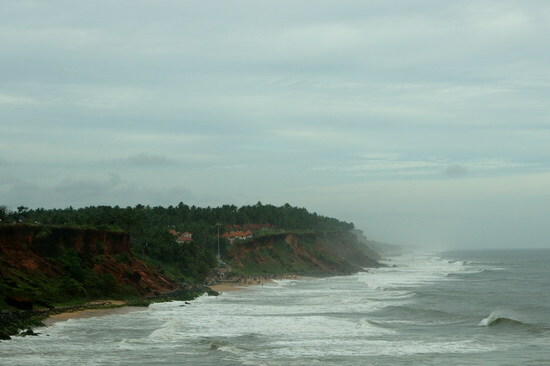 The station at Varkala is well-connected to most places in south India including Kozhikode, Thrissur, Ernakulam, Alleppey, Kollam, Malabar, Netravati, and Trivundrum. Mumbai is also well linked up with daily trains via Kanyakumari and Netravati. From Bangalore, take the direct train to Kanyakumari and from Chennai take the overnight option on the Trivundrum mail train. The Kerala Express links Delhi direct and daily to Trivundrum. The beach is just 11 km off NH47, which is the main road between Salem and Kanyakumari via Thrissur (265 km), Ernakulam (186 km), Kollam (39 km) and Trivandrum (46 km). You can get buses to Kallamballam Junction, 9 km from the town, and then long-distance buses to all over India from there. The best time to visit is between the months of October and April when it's sunny pretty much all of the time. Between the months of December and February it can get a bit chilly at night so take an extra jumper or two. During the summer it can be ridiculously hot and humid; although some tourists do venture there in August, it can be quite unpleasant.